Greece’s Foreign Minister Nikos Kotzias on Monday urged Turkey to be “sufficiently wise” as to discuss preparations for a new round of talks in Geneva on the Cyprus issue, following his meeting with United Nations special envoy on the Cyprus issue Espen Barth Eide in Athens.“Let it be sufficiently wise and talk with us, so we can prepare an international conference in Geneva on the security of Cyprus and how to rid the island of the 1960s treaties, those of Zurich and London, on guarantees and the so-called Alliance,” Kotzias said after lengthy talks with the UN envoy. Eide, on his part, offered assurances that the effort to find a common ground for the Geneva talks will continue: “It is an ongoing process. It is not easy but we are not giving up,” he said after the meeting. The UN envoy said his talks in Athens had been “constructive and useful” and that he would now go to Ankara to continue his efforts there. 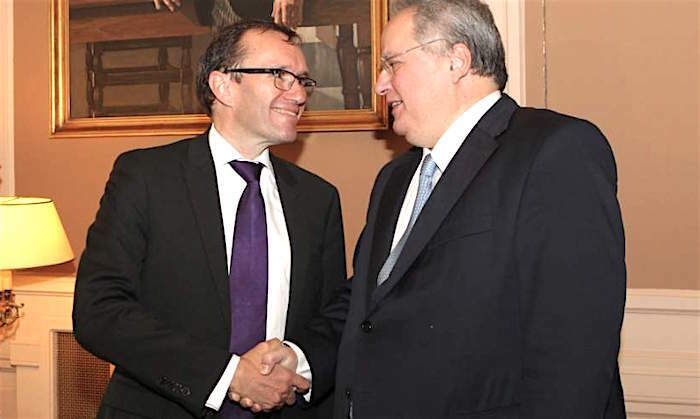 “We must be prepared because it is an international issue but the final decision must be taken in Cyprus by the two leaders on whether they are prepared to find a common platform for a new Geneva Conference,” Eide said. The focus now was not so much on the substance of the talks but how these will be organized and on deciding the agenda, he added. On the issue of security and guarantees, where the talks have stumbled, Kotzias said this was an issue “linked to the necessity and the demand that Turkey understand that it must withdraw its troops from Cyprus.” Ankara will also have to give up rights to intervene on the island for its own ends, he said. “Unfortunately, Turkey continues to put forward its own needs and not the needs of the two communities and their three minorities,” he said, while Ankara simply refused to discuss the proposals put forward by the Greek side on these issues. According to Eide, the UN was “ready…for more thoughts on the issues that concern the guarantor powers,” while noting that “we are not there yet.” The envoy said he was not asking “anyone to put pressure on anyone” but also voiced his concern that “the process is in serious trouble” and his conviction that its failure “is not in the interests of Greece, Turkey or any other international actor.” Even though it concerned the Cypriots, he added, failing to find a solution could have international repercussions, impacting relations between Greece and Turkey, Turkey’s relations with the EU and the general situation in the Mediterranean. This was happening at a time when the situation in the region was difficult and when there were opportunities for cooperation in energy, he added. Greece Wins ‘Ms. Transcontinental International’ in Atlanta!